The Roman Catholic Church is what it claims to be only if it can prove PAPAL PRIMACY. 1. 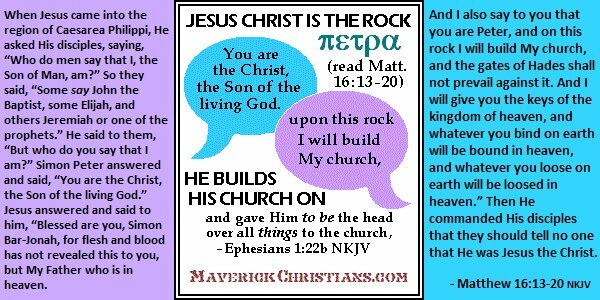 St. Peter is the rock on which Christ’s church is built upon instead of Christ. 2. Based upon the above, that St. Peter had successors to his apostolic authority. 3. Based upon the above, Roman Popes alone are successors to St. Peter. What historical writings are there that prove all three of these points mentioned above? This is altogether necessary to make the case for universal authority of the Church of Rome if this is to be established as true. What is evident is that these claims for the Roman Catholic Church denomination came much later than apostolic times. The first pope to claim universal authority over all the churches was Pope Siricius. This was when the east/west split also began to develop which was during the late 4th century. Therefore, it is evident that this is the date of the true beginnings of the Roman Catholic Church. Its claims of universal authority are later inventions after Christianity’s true beginning. The Roman Catholic Church is NOT the one true and only Christian Church. Christ’s true universal (or catholic) church began 33 A.D. (or 29 A.D. really) which was not and is not the Roman church. Christ’s church are all those who place trusting faith in God solely through His Son Jesus Christ for the free gift of eternal life and the forgiveness of all sins. Christ’s universal church is not any one denomination like Roman Catholic, Eastern Orthodox, Ukrainian Orthodox, nor Protestant denominations, nor any other. In fact, Christ’s church is not all denominations either nor is it any combination of them. His Church are those who trust in Him alone (not a church, self, nor others) for salvation. What we can see instead, though, is that the Roman Catholic Church teaches an entirely different gospel than Christ and the Apostles taught as demonstrated in the New Testament. For example… The New Testament does not teach paying indulgences, nor about scapulars, nor prayers to St. Mary. There are many other matters where the Roman Catholic Church contradicts the teachings of Christ and the Apostles recorded in the Holy Scriptures. Be sure to visit our link to “Fascinating Reading of the Holy Bible for Roman Catholics” to find out more. So, not only is the Roman Catholic Church NOT the one true and only Christian church. It does not even qualify as a Christian church at all due to its false teachings. It is a major false religion. Are Roman Catholics showing you early church quotes to try to prove their faith to you? • Did these quotes prove all three of the points mentioned above or are they lacking? • Are the quotes earlier than the late 4th century? • Were these were quoted accurately, not mistranslated? • Do these quotes hold to the same meaning those citing them say about them within their own passage contexts? • Did the authors of the quotes make other statements that go against how Roman Catholics choose to interpret them? • Does what was quoted match with objective sources on the documentation? • Were the writings actually from the date cited about them? • Are the documents cited proven not to be forgeries? Rome did have a powerful place in history but you will find that Papal Primacy is a later development, not what was taught earlier. History has also held the question, “Who was St. Peter’s successor to his bishopric?” Was it Linus or Clement? A wider view of history is required when examining such subjects. If you have solid proof, contrary to what has been said here, we would like to know. If you do not have such solid proof, why then maintain the myth? Do you see that Jesus said, “And I also say to you…”? What Jesus said was built upon what He had already previously stated. Who was Linus? Did he know the Apostle Paul? Was he the first pope? Was he the second bishop of Rome after the Apostle Peter? Was he even a bishop? By Bob Thiel, Ph. D.